Rent villas and cottages in Saint-Jean-d'Angély Arrondissement, France with private pools. 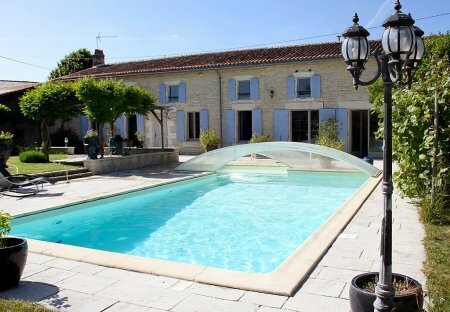 This 4 bedroom house with private pool is located in Asnières-la-Giraud and sleeps 9 people. It has WiFi, a garden and barbeque facilities. 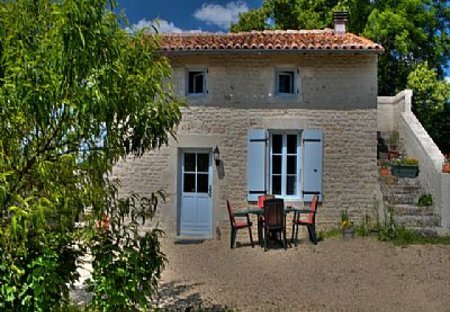 This 3 bedroom house with private pool is located in Aumagne and sleeps 6 people. It has WiFi, barbeque facilities and parking nearby. The high external wall and huge timber entrance doors hide a renovated detached farmhouse, large, private, fully enclosed gardens and a larger than average private swimming pool. This lovely semi detached house has been completely renovated to a good standard by its owners, and features original oak beams and an enclosed, above-ground swimming pool (3.5m x 7.5m). Set in its own beautiful, secluded grounds, the Millhouse provides exceptional 5 star accommodation in the heart of the Charente Maritime countryside. A delightful, spacious property, beautifully renovated to provide comfortable and stylish holiday accommodation. In a tranquil setting on the outskirts of the village. Near the charming village of Aulnay and five minutes drive from the old town of St. Jean d'Angély stands this old restored stone house with a private swimming pool. This very pretty 3 bedroom 3 bathroom cottage sits in the heart of the small village of Salles lès Aulnay. This 2 bedroom cottage sits in the heart of the small village of Salles lès Aulnay. This magnificent house has an open living and kitchen area. Stone walls and beams retain the rustic flair. This one bedroomed semi-detached bungalow has been completely refurbished and features now include a cosy lounge and fitted kitchen. Nestled among the sunflower fields and vineyards in a beautiful French hamlet. This 19th century barn was converted in 2013 in a lovely holiday property and has been decorated in a contemporary style to a very high standard. Featuring a fully fitted kitchen. This modern 4 bedroom villa features a large fully fitted kitchen with stainless steel appliances, a master bedroom with en-suite and 3 other good sized bedrooms share the main bathroom. In the sunny Charente Maritime region, just a short stroll from a charming market town, Chateau de la Vie offers elegance and sophistication in this beautiful part of western France. A high quality, private and spacious farmhouse enclosed within a charming walled garden. Interior furnishings are eclectic and elegant and it is fully equipped with everything you may need.